The Best PPC blogs from thousands of top PPC blogs in our index using search and social metrics. Data will be refreshed once a week. 2.28 Netvantage Marketing – SEO/PPC/Analytics & More! PPC newsletter is a comprehensive summary of the day's most important blog posts and news articles from the best PPC websites on the web, and delivered to your email inbox each morning. To subscribe, simply provide us with your email address. Bloomington, IN About Blog PPC Hero is a blog written by the experts at Hanapin Marketing, a PPC advertising agency in Bloomington, IN. We are dedicated to educating the PPC industry on cutting edge trends and updates. PPC Hero provides tips on the expert skills and management techniques of successful pay per click advertising management. Facebook fans 3,808. Twitter followers 33,099. Palo Alto, CA About Blog PPC stands for Pay Per Click. We are your one stop shop to learn everything about there is to know about paid search marketing. Facebook fans 458. Twitter followers 4,117. Louisville, KY About Blog Clix Marketing expertly creates and manages pay-per-click text and display advertising campaigns via Search and Social channels like Google AdWords, Microsoft adCenter, Facebook, Twitter, LinkedIn, YouTube, Yelp and others. Find Tips and Thoughts on Google AdWords, Yahoo! Search Marketing, Microsoft adCenter and All Things PPC. Facebook fans 336. Twitter followers 2,292. Facebook fans 71,389. Twitter followers 279,878. About Blog Acquisio is a performance media solution that enables digital marketers to optimize their search campaigns and report on social, mobile and display initiatives. Our automated system does 65% of the work ensuring that more of users’ time is free for analyzing data and improving campaigns. This blog takes a deep dive into every PPC marketer’s mind. Facebook fans 4,877. Twitter followers 8,288. Los Angeles, California, USA About Blog ClickZ is the premiere pay per click ad network. Our goal is simple - providing our users with an extraordinary search experience! Facebook fans 1,427. Twitter followers 303. United States About Blog Search Engine Journal is dedicated to producing the latest search news, the best guides and how-tos for the SEO and marketer community. Keep up with the latest breaking news and intelligence on PPC, CPC, AdWords or Bing Ads. Facebook fans 163,438. Twitter followers 161,544. SEW HQ About Blog The authoritative guide to search engine marketing (SEM), search engine optimization (SEO), paid search advertising (PPC) and social media marketing. Find news articles, guides, reviews and commentary about Search, PPC, Social, Mobile, Analytics and more. Facebook fans 41,500. Twitter followers 189,933. About Blog We're 3Q Digital, & we're bringing the performance, service, & fundamentals we learned as SEM powerhouse PPC Associates to the world of full-service digital marketing. We're out to fundamentally change full-service digital marketing by helping bold, innovative clients change their industries. 3Q Digital practices integrated digital marketing including PPC, Facebook and banner advertising, & more. Facebook fans 7,101. Twitter followers 3,613. San Francisco, CA About Blog Information and discussions related to pay-per-click advertising. The primary focus is Google AdWords and Bing Ads, but other advertising platforms are acceptable, such as Facebook ads. Facebook fans 1,166,936. Twitter followers 525,826. Seattle About Blog Portent Inc. is an integrated digital marketing agency located in Seattle. We help businesses grow by making them weird, useful and significant online. Here you can learn more about our approach and techniques for improving a company's exposure and performance in paid search. Facebook fans 3,890. Twitter followers 4,949. Nottingham, UK About Blog Multi-award winning digital marketing agency with offices in Nottingham & London, powered by a team of experts delivering innovative digital campaigns. Our mission is to be recognised as one of the leading providers of digital marketing services in the UK. Facebook fans 827. Twitter followers 2,340. About Blog Get the latest news search engine industry news and analysis from The SEM Post with top industry experts on SEO, PPC, social media, mobile & video. Facebook fans 3,294. Twitter followers 5,044. Philly, San Diego About Blog An internet marketing agency specializing in SEO, PPC, & Analytics with a strong focus on quality results and giving back to the community. Facebook fans 3,989. Twitter followers 18,044. Bloomington, IN About Blog Hanapin Marketing is a premiere digital marketing agency focused exclusively on PPC (pay-per-click) marketing. Founded in 2004, the company manages and optimizes paid search programs in areas including search marketing, conversion rate optimization, lead generation, social advertising, remarketing, programmatic and display marketing. Facebook fans 1,205. Twitter followers 6,251. About Blog ClickCease is a Ultimate PPC Click Fraud Protection Service. We protect Google Adwords campaigns of click-fraud automatically. Facebook fans 1,471. Twitter followers 1,050. Raleigh, NC About Blog ROI Revolution is a Digital Marketing ecommerce agency focused on PPC, Social Media, SEO, CRO, & Amazon advertising for retailers & lead gen in B2B and B2C. Facebook fans 826. Twitter followers 2,736. About Blog A digital marketing blog by UK digital marketing lecturer and expert trainer Darren Taylor. My mission is to teach the world how to win at SEO and PPC! Facebook fans 24. Twitter followers 8,526. Raleigh, NC About Blog TheeDesign is an award winning web design & digital marketing agency in Raleigh. We do WordPress, WooCommerce and Magento development, SEO, PPC, and more. We are a Raleigh internet marketing company providing paid search marketing services like Google AdWords account management and other PPC advertising solutions. Facebook fans 1,352. Twitter followers 2,208. About Blog Looking to improve your knowledge in PPC Affiliate Marketing? Read strategy guides, follow how to's & access exclusive tricks and tips. Facebook fans 1,256. Twitter followers 3,723. Portland, Maine About Blog Maine internet marketing agency that uses a data driven approach to search engine optimization, paid search, responsive web design, and web development. Blog posts from Hall Internet Marketing on Paid Search (PPC). Facebook fans 402. Twitter followers 2,188. Cheshire, England About Blog Click Consult is a multi award-winning search marketing agency with a focus on organic and paid search. We work exclusively with a portfolio of brands and SMEs who are looking to increase their online visibility and return on investment through our bespoke search marketing solutions. Keep up to date with the latest SEO, PPC and Social Media developments with the Click Consult Blog. Facebook fans 937. Twitter followers 3,629. New York, NY About Blog Discover how the PMX online marketing agency helps big brands beat their sales plans with expert strategies in paid search, SEO, social media & more. Stay up-to-date on paid search strategy & search marketing tips from PMX Agency's thought leaders. Our paid search blog posts offer tips for succeeding in Google Adwords and within competitive industries. Facebook fans 1,445. Twitter followers 1,013. Montreal About Blog Higher Education Marketing offers Internet marketing services for colleges and Universities: Search Engine Optimization, Pay Per Click marketing and Google Analytics. Facebook fans 1,790. Twitter followers 2,584. About Blog News, Guides and How To's for Pay Per Click Professionals. India About Blog Ralecon is a highly result oriented Digital Marketing Company with 5 years experience in online industry. We provide comprehensive digital marketing solutions for clients of all sizes across dozens of different sectors, ranging from small businesses to global corporations. Facebook fans 1,657. Twitter followers 121. Portsmouth & London UK About Blog An award-winning London and Portsmouth-based search marketing agency. We combine intelligent algorithms with smart people to achieve effective results. Get advice and tips on all aspects of PPC - AdWords, social media ads, remarketing and other forms of pay per click marketing - from our specialists. Facebook fans 471. Twitter followers 2,565. 28. Netvantage Marketing – SEO/PPC/Analytics & More! Chicago/Lansing/Grand Rapids About Blog Netvantage Marketing provides SEO management services to clients throughout the United States from our offices in Chicago, Grand Rapids and Lansing, Michigan. Netvantage Marketing’s mission is to help you get the most out of your website and Internet marketing budget. We help our clients leverage the web as a strong marketing tool. Facebook fans 463. Twitter followers 2,299. Manchester, England About Blog PPC Protect was born after experiencing the devastating consequences of click fraud first hand from our own campaigns. Find the latest PPC news and tips written by our PPC experts, focusing on platforms such as Google AdWords and Bing Ads. Become a PPC master today. Facebook fans 29. Twitter followers 74. Pennsylvania About Blog Clicks Geek is the premier U.S. based white label PPC agency. As a certified Google Partner we specialize in managing and white labeling Google Adwords campaigns for SEO companies, consultants, web designers and marketing agencies. Facebook fans 538. Twitter followers 461. Cambridge, UK About Blog In 2012 two Cambridge graduates realised there had to be a better way to run paid search campaigns and create real value for businesses in the retail sector. They teamed up with Italian business strategy director Luca Senatore, who spent the last three years assembling a team of PPC specialists speaking seven languages. Facebook fans 119. Twitter followers 600. East Lansing, Michigan About Blog Here you will find ramblings about all things PPC. Blog by Melissa Mackey. Facebook fans n/a. Twitter followers 10,547. About Blog Rothman PPC provides professional AdWords management services for clients around the country. We also manage Bing Ads campaigns. We focus on search ads and on lead generation campaigns for small and regional businesses. Facebook fans 243. Twitter followers 147. Arlington, MA About Blog Group Twenty Seven is a boutique PPC agency and AdWords Certified Partner that manages online advertising with a focus on ROI and client relationships. Tap into PPC tips, strategy and tactics in Group Twenty Seven's PPC blog. Our insights come from years of managing PPC accounts of all sizes across sectors. Facebook fans n/a. Twitter followers 982. Sydney, Australia About Blog We're digital marketers specialising in SEO, PPC and content marketing. Click here if you're ready to start growing your business. We help business owners achieve their wildest dreams by engaging in a more efficient type of marketing – one where the customer comes to you. Facebook fans 1,134. Twitter followers 656. Massachusetts About Blog PPCChat is a weekly Twitter chat that brings together PPC specialists and online marketers across the world. Within this forum, knowledge is shared & debates ensue in order to educate and enlighten the PPC community. The hashtag is also used throughout the week to ask questions, share blog posts, and to present PPC news and information. PPC Chat is the go to source for PPC discussions and updates. Facebook fans 368. Twitter followers 11,877. Tempe, AZ About Blog ParaCore is a Phoenix, AZ based company that delivers PPC advertising for high-growth companies using Google AdWords, Facebook Ads, and other paid media. Facebook fans 408. Twitter followers 553.
worldwide About Blog A specialist team of PPC experts balancing ambition with expertise to consistently deliver successful campaigns and measurable growth. Our mission is to deliver measurable growth for our clients through PPC. Facebook fans 97. Twitter followers 210. Planet Earth About Blog PPC hubbub aims to fight through the hubbub of Paid Search (PPC) and Search Engine Marketing (SEM) News to give you the latest updates; simplified. Facebook fans 35. Twitter followers 490. About Blog Discover the latest with Pedestal. SEO, PPC, and SEM news and advice. Stay up to date with the most important aspects of search engine marketing. Milwaukee, WI About Blog Granular helps manage and grow digital pay-per-click (PPC) advertising for businesses and non-profits around the country. We stay focused by not offering services that get in the way of our core expertise. We’re a talent-heavy, laser-focused group of digital marketing experts delivering a level of unbeatable service and data driven results. Facebook fans 251. Twitter followers 4,826. Middlesbrough, England About Blog We are a PPC specialist agency who have a hunger and drive to deliver highly efficient and high performing PPC advertising on behalf of our clients. Are you looking for the latest PPC news, views & opinions? If so then subscribe to the Mabo Media blog to keep up with the latest updates on all things pay per click. Facebook fans 1,457. Twitter followers 2,534. Dublin City, Ireland About Blog Our aim is to be the number 1 online advertising agency in Ireland and to always put the customers needs first. News and views on the Digital Marketing World brought to you be Pay Per Click Ireland. Irelands foremost Google Adwords Management Agency. Facebook fans 101. Twitter followers 1,050. Aliso Viejo, CA About Blog We are a full service PPC Marketing Agency specializing in PPC Management, Campaign Optimization, Retargeting, and Display. All of our Adwords Certified team members believe a successful campaign is about more than just getting clicks... it's about building a strategic campaign that increases customer acquisition, conversions and ROI. Facebook fans 59. Twitter followers 47. Milwaukee, Wi About Blog Joseph Martinez has been a Digital Marketing Manager in Milwaukee for several years. He’s worked with B2B and B2C companies to boost traffic and ROI. Working with clients of all sizes, B2B and B2C, to grow traffic and lead generation. Search & Display PPC services to help own your industry online. PPC is more than my job. This is a blog about tricks and tips I've learned along the way. Facebook fans 37. Twitter followers 2,668. CONGRATULATIONS to every blogger that has made this Top PPC Blogs list! 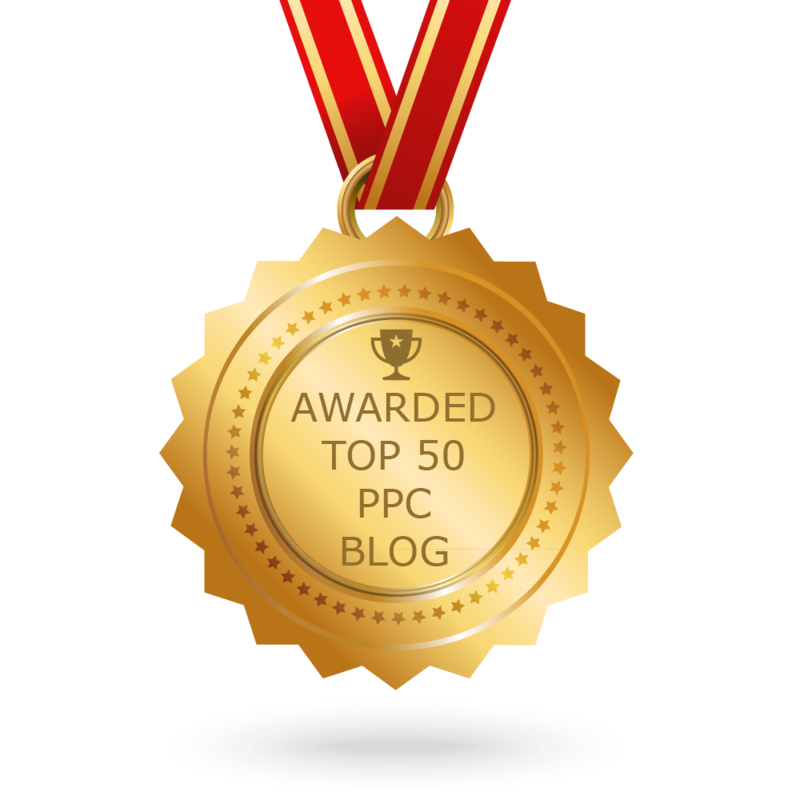 This is the most comprehensive list of best PPC blogs on the internet and I’m honoured to have you as part of this! I personally give you a high-five and want to thank you for your contribution to this world.